Preparing for her anticipated role in the coming fourth season of American Horror Story, Sarah Paulson said that she’s pushing herself for the character she plays in the hit Ryan Murphy series, claiming she’s her own biggest critic. Sarah Paulson has been present in all three seasons of American Horror Story. She portrayed Billie Dean Howard, a psychic in the first season Murder House. In Asylum, she portrayed Lana Winters and in the last Season, Coven she portrayed Cordelia Foxx, a witch. Casts of the critically acclaimed show are already cradling on for the fourth season. Lange is already practicing a German accent for her role. Meanwhile, Paulson was asked if she’s training on the same approach, she smiled widely and confessed, “I’m not working on an accent, but I’m working on something”, which was more intriguing. She emphasized that she didn’t want to play a cartoon of the character that she played and wanted to hold on to who the character of Lana Winters. The actress revealed how she can be her biggest critic and she gets frustrated when she hasn’t asked for another take. “I get really panicked sometimes when I can feel the clock going. We’re all under the gun; our show’s very expensive. There’s never enough time,” she said. “I think the comfort of being on a show for a while means I can look over at James, our camera operator, and say, ‘Can I please have another one?’ And he’ll find a way to help me out, which I never can do on a movie ever,” American Horror Story season 4 cast Sarah Paulson added. For now, series creator Ryan Murphy only said that Sarah Paulson’s role could be the most physically and emotionally challenging among the characters in the show. When pressed to elaborate about which role in particular, He only disclosed Entertainment Weekly Radio that it’s the most taxing character he’s ever created and that he’s nervous for Sarah. It’s no surprise how Paulson nailed transforming herself since playing three distinctly different characters on the last three seasons of American Horror Story. It has been confirmed that we will be seeing her for more next season! Murphy, who will direct the season premiere added that the new season will take place during the fifties. The last time he stir an episode was back in season 1 for the pilot. 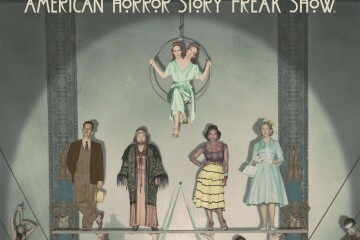 Murphy expressed his excitement for the Freak Show, stating they will try and do the opposite of what they’ve done before. He promised viewers that American Horror Story Freak Show will be a super scary thrill ride. Gian is a big fan of TV, movies, comic books, and video games, literally anything that prevents him from moving any part of his body except for his eyes and his pudgy fingers. He writes for money to pay for cable and internet. He has a Labrador Retriever named Borgy.